Hundreds of thousands of EI MS spectra, MS/MS spectra, GC data & retention indices, and/or chemical names/structures. World’s most widely used and trusted mass spectral reference library. The NIST 17 mass spectral library, the successor to the NIST 14, is a fully evaluated collection of electron ionization (EI) and MS/MS mass spectra, with chemical and GC data, plus search software to identify your own unknown spectra. It is a product of a more than three decade, comprehensive evaluation and expansion of the world’s most widely used mass spectral reference library by a team of experienced mass spectrometrists at the National Institute of Standards and Technology (NIST) in which each spectrum was examined for correctness. Electron ionization (EI) mass spectral library – 306,622 carefully evaluated spectra of 267,376 unique compounds, with identifications, nearly all with chemical structures. You may search names of NIST compounds online. 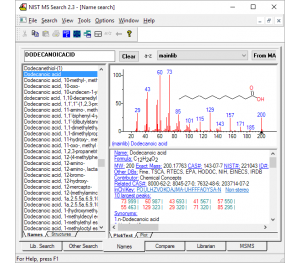 NIST MS Search software – software for searching (identifying) compounds from their mass spectra and for browsing mass spectral libraries. Also includes MS interpretation programs for analyzing mass spectra on the basis of chemical structure, molecular formula, isotopic patterns, and more. Documentation – Approximately 50 page printed and electronic manual on setup and basic usage. Additional information is in the help files. Libraries are formatted the binary format suitable for use alone or by the NIST MS Search software (and AMDIS). Additional instrument-specific formats (e.g. Agilent ChemStation and MassHunter) are available separately to permit library searching directly within your GC/MS or LC/MS data system. With each purchase, we ship a DVD (installs software, libraries, and documentation) and a printed manual. If you don’t have a DVD drive, you can electronic download using the web address and license number on the DVD label.